Home/Success Stories/Fit after 50 and Hitch Fit for Life! 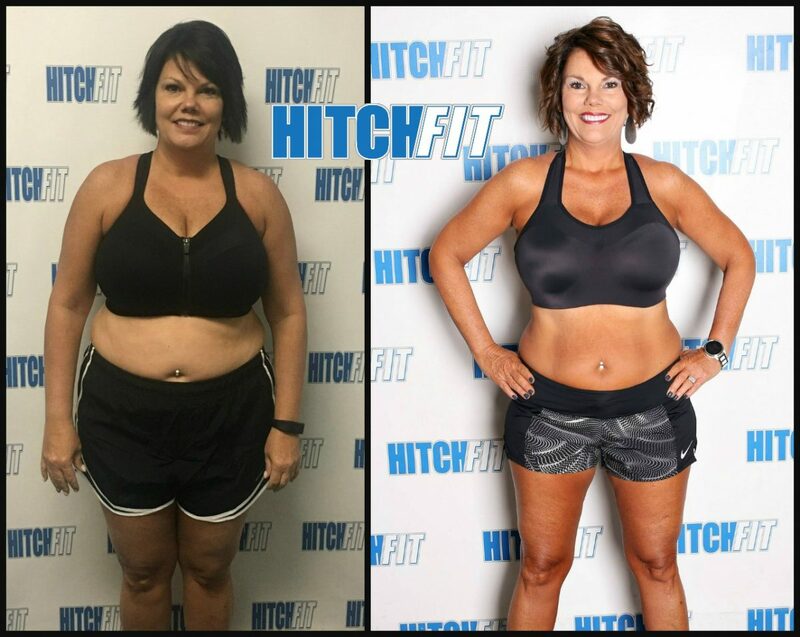 Lori is an amazing motivation for those who are ready to get Fit After 50! “It is official – I will be a Hitch Fitter for life. While it is an honor to share my transformation story, this is only the first chapter! Until 2013, I would have considered myself to be active and in shape. I was running half marathons and cross-training with my tri-athlete friends (knowing I would never complete in a triathlon due to my fear of open water swimming). I dabbled a bit in crossfit – I was intimidated and never felt comfortable or strong enough to do the workouts. I was always the last to finish the WOD, or I always had to modify my workout. When 2013 showed up, I had just gone through a divorce after being married for 18 years, built a brand new home, and moved my office from Olathe to Corporate Woods. My social life (6 and sometimes 7 days per week) involved unhealthy food and beverage choices and sleep deprivation. To top everything off, I own my own business of managing non-profit trade associations which equates to serving over 15,000 professional members, a lot of travel, meetings with food/drinks, social events, conventions and trade shows, and a teensy bit of stress. 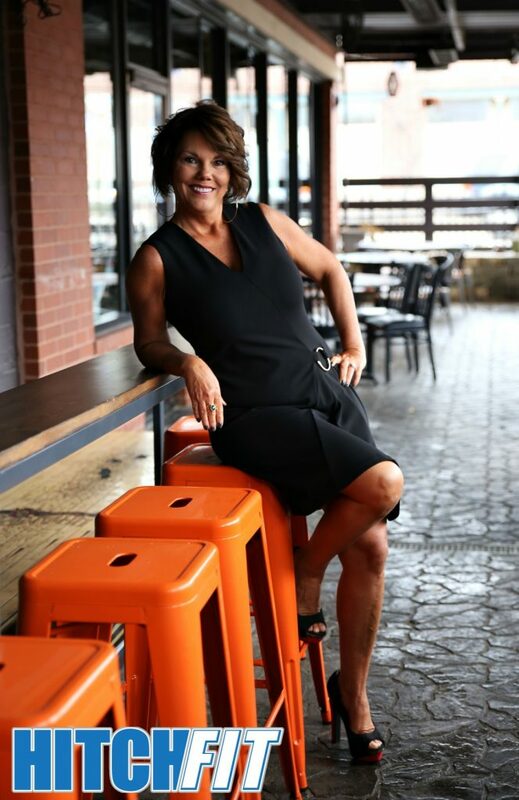 Between 2013 and 2018, I added turning 50, meeting the love of my life, remarrying, and becoming a step-mom to four children – I was a hot mess! With an emphasis on mess. The weight started pouring on. 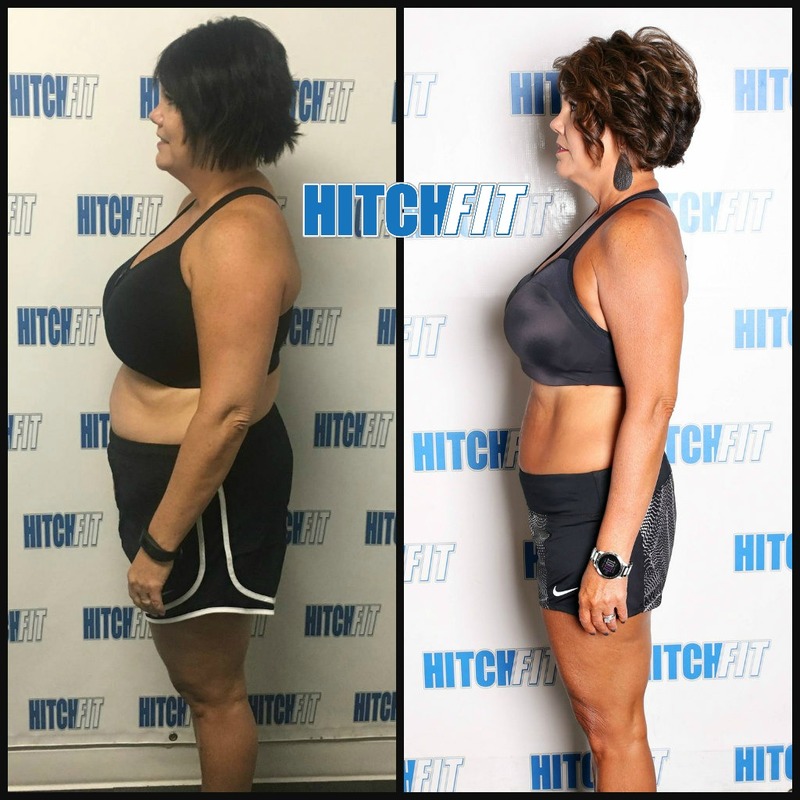 My Hitch Fit journey started in March of 2017 with the online program. One of my best friends and her husband experienced great success. Their nutrition was on point and they had access to a professional gym. I was feeling desperate, and wanted change. I made it two weeks. I was not ready. At the same time, two more of my best friends, Anissa and Rob Elsey, started one-on-one personal training at the gym with Micah and Diana. I watched their progress in complete awe. Anissa always gives 110% to everything she does, but to see Rob take it so seriously was inspiring to me. In December of 2017, just after they finished their initial transformations, we met for dinner. Rob told me that his life was so changed by Hitch Fit that he was shifting his career to become a personal trainer. I left dinner knowing that in 2018, I was going to find time in my chaotic life to focus on me – and become Rob’s first “project.” In January, I started working with my cousin Alex, who is an amazing personal trainer and fitness model. 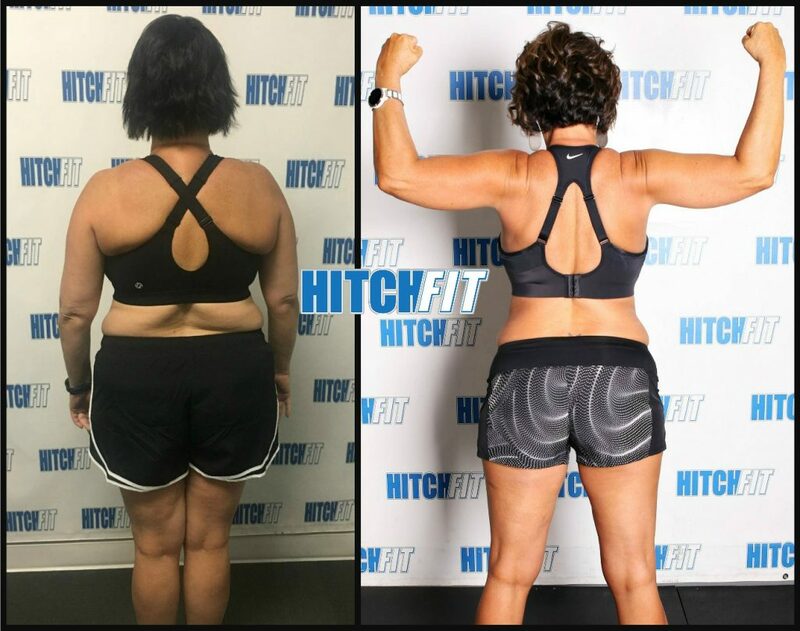 She came to my house two times per week and gave me the confidence I needed to jump into Hitch Fit and give it my all! When Rob was “official” – I scheduled my initial consult. I have never been the person who weighs every day so when I stepped on the gym scale, I was truly mortified – which is an understatement. When Rob told me he was going to take a “couple of pictures” – I was beyond mortified (and still am!). I was 35+ pounds heavier than I had ever been in my life. I was embarrassed. I was frustrated. The day I started (March 22) I was 110% committed. I was 100% on point with nutrition (which is over the top easy, by the way) and I stopped drinking alcohol for 14 weeks. Luckily I did not drink soda or other high calorie beverages. I remember Diana saying “you can do anything for 12 weeks.” But, my life was so social – I love happy hour, I love my tribe, and I LOVE wine. In addition to the amazing results I experienced, even in the first week, I found that I was actually saving hundreds of dollars per week. It was nothing for me to spend $300-400 per week on happy hour – a few fancy glasses of wine and unhealthy food several evenings per week adds up quickly. I also had the full support of my friends and my husband Bill. By simply eating a couple of meals per week on my plan, Bill dropped a few unwanted pounds. In November, he started training with Eric Reynolds and transformed from “skinny fat” (which makes us both laugh) to the most fit he has ever been in his life, too. I love going to the gym. I love watching the other trainers, meeting other clients and celebrating their progress, but most of all, I love Rob. He pushes me. We have known each other for so long that he’s like a brother to me. We are the same age – we’ve laughed, cried and celebrated together over the last 20 years. I schedule my sessions, put them in my overwhelmingly busy calendar and I show up – every single week for 10 months I have shown up. And, I will continue to show up! There are three things I would tell anyone who feels inspired to make a change – 1) be ready. If you are not ready to commit to yourself 100%, you won’t be successful; 2) don’t let cost be an issue. You will save money. The investment in yourself produces an amazing return that can’t be measured in dollars and cents. Take a look at what you spend on breakfast, lunch, dinner and happy hour. It can be frightening; 3) the support of your trainer, the other trainers and Micah and Diana is real, positive and motivating. I have never met a team more dedicated to the success of every single person who walks through their doors, or subscribes to the online program. Micah and Diana have created a culture of love, respect, support and dedication, and it shines brightly! I can’t wait to see what my Hitch Fit future brings! Are you READY for your transformation with Hitch Fit Personal Trainer Rob Elsey? Rob offers one on one personal training at our Parkville and Midtown Kansas City gym locations. Or call 816-753-8900 and request to train with Rob!